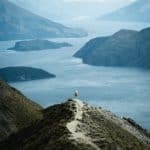 Imagine yourself out in the wilderness at sunset, with a wall of moss-covered rocks in the foreground, an elegantly shaped tree slightly farther away and snow-capped mountains in the distance. 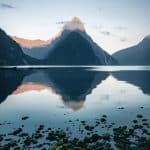 How can you get all three of these elements in focus in the rapidly changing light? That’s where using hyperfocal distance can help. Although it sounds intimidating, and involves math and physics, the concept is simple. The hyperfocal distance is the spot where you focus your camera to ensure maximum depth of field, going all the way to infinity. Imagine a hyperfocal distance of 25 feet. By focusing on the tree that’s 25 feet away, you get everything from the rock wall about 12 feet away (1/2 the hyperfocal distance) to the mountains miles away in acceptable focus. Anything between you and the rock wall will not be in focus. Note the term “acceptably sharp.” No normal lens can render a deep depth of field in perfect focus, front to back. There will be some blurring, which will be noticeable at high magnifications, but acceptable in normal viewing. 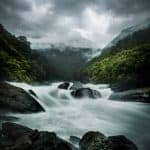 You can overcome those optical problems by using focus stacking or an expensive tilt-shift lens but you’ll encounter many situations where conditions or lighting are changing too rapidly to use either. That’s where hyperfocal distance comes to the rescue. The hyperfocal distance was such an important part of photography in the old days that scales were engraved onto lens barrels. In the old days, lenses had depth of field markings engraved on the barrel, which helped you focus at the hyperfocal distance. On this 50mm lens at f11, if you focused at 25 feet (the hyperfocal distance) you’d get everything between 12 feet and infinity in focus. It’s still one of the handiest tools for estimating where to focus for maximum depth of field that reaches to infinity. 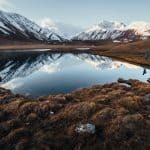 If the light is changing fast, if there is movement in the frame, if you only have a brief window in which to take the shot, hyperfocal distance is the tool you use. 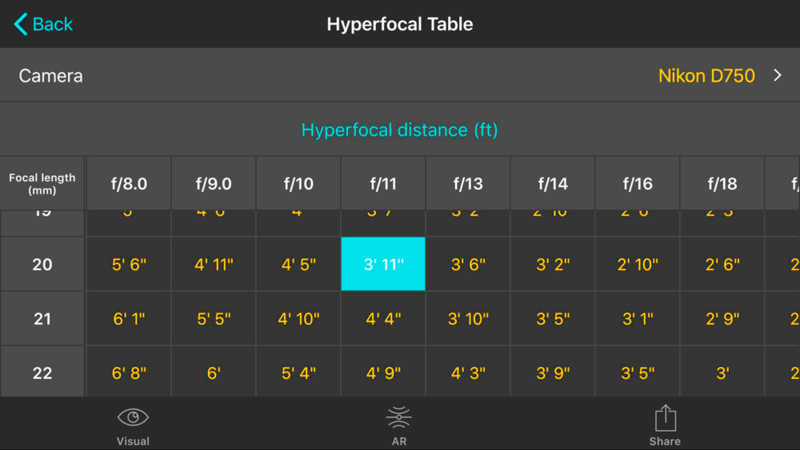 Consulting lens markings, or tables in an app on your phone, you’ll get a quick idea what your depth of field is at the settings you’ve chosen. 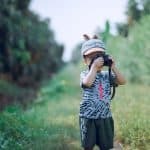 If the depth of field isn’t sufficient, you can rapidly switch your aperture or zoom out your lens or reposition your camera to make the numbers, and your shot, work. The hyperfocal distance is not a fixed, immutable number, as you might have gathered. It is determined by a combination of your camera sensor size, your lens and aperture. A wide-angle lens will have a greater depth of field and a closer hyperfocal distance than a normal or a telephoto lens. 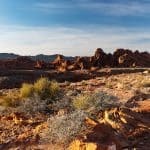 Photographers who want a nearby strong foreground object to anchor a composition like using wide angle lenses for their expansive depth of field. 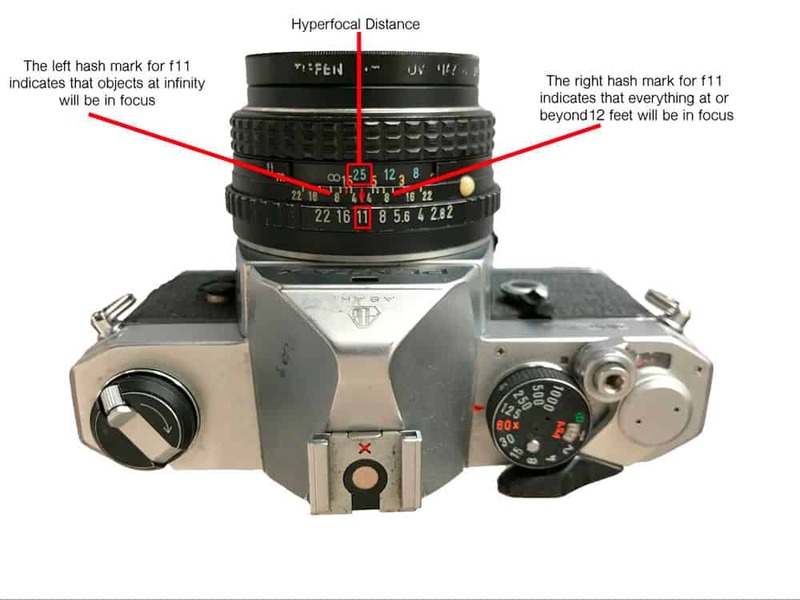 The aperture you use also affects the hyperfocal distance. A smaller aperture, like an f16, will have a closer hyperfocal distance and a wider depth of field than a wide-open aperture, like f2.8. That’s why you often see landscape photographers using f11 or f16. The smaller the sensor, the greater the depth of field and the closer the hyperfocal distance. A crop sensor has a greater depth of field and closer hyperfocal distance than a full-frame sensor. A micro 4/3 sensor has an even greater depth of field and closer hyperfocal distance. The tiny sensors in smart phones give almost limitless depth of field. 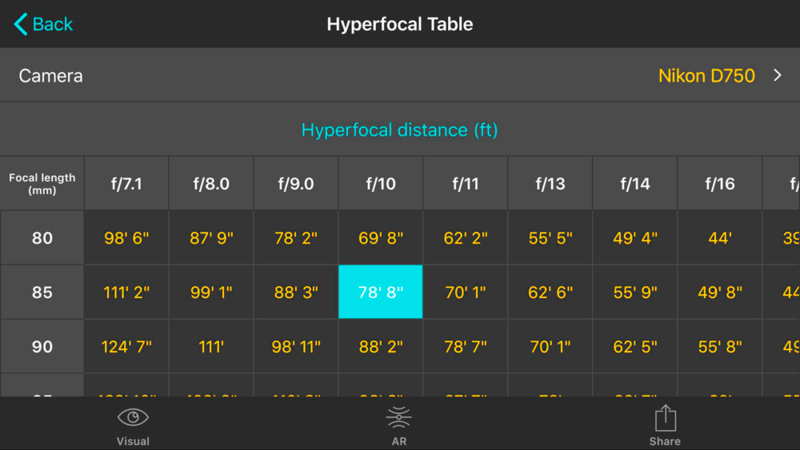 Using the PhotoPills app to find the hyperfocal distance for a 50mm lens at f11 on a D750. I normally round up, for an answer of 25 feet. 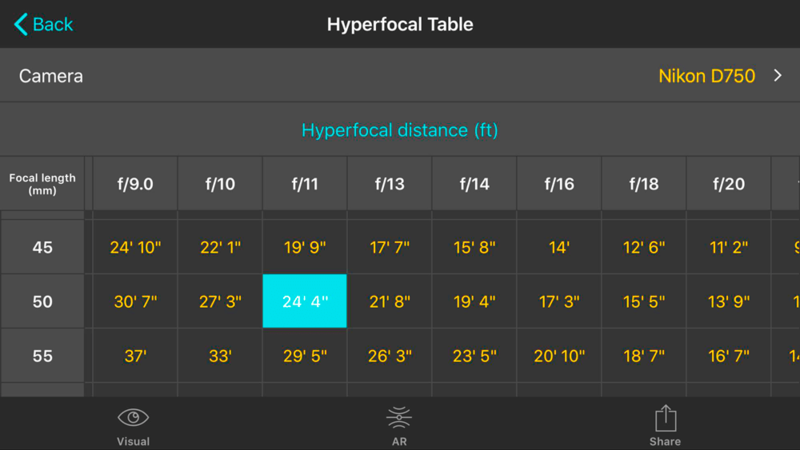 You can calculate your hyperfocal distance for any situation using the calculator function of your phone, but it’s far easier to use one of the dozens of available apps or online Depth of Field calculators. 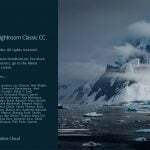 I use PhotoPills, because it’s well done has a ton of other tools, but any of the popular apps will work. *In the real world, a lens can’t perfectly focus a point of light on a camera sensor. There’s a little bit of blur. The Circle of Confusion (CoC) is a measure of that blur, in fractions of a millimeter. Generally, a full-frame sensor has a CoC of about 0.03 and a crop sensor has one of about 0.02. Using my Nikon D750 and a 50mm lens at f11. Valley View 1/125 sec., f11, 20mm, Nikon D750. 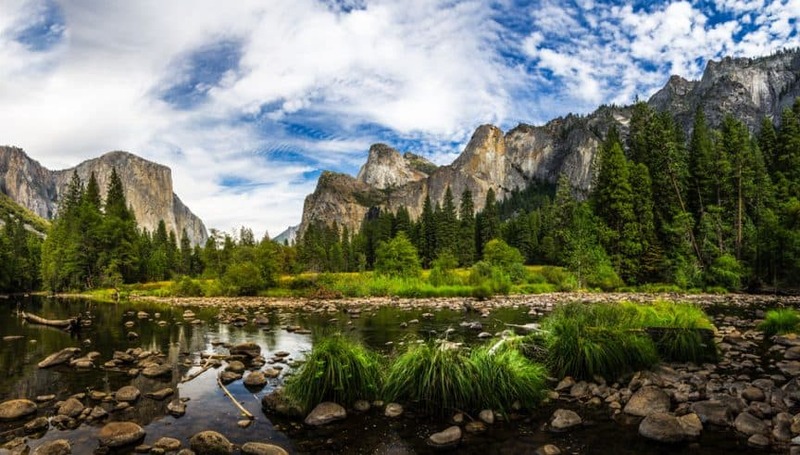 Imagine being at Valley View at Yosemite National Park in California. It’s crowded and you only have a minute to shoot before someone gets in your way. 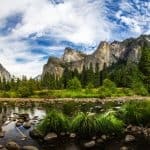 You want the rocks and the tufts of grass in the Merced River to be sharp and you want the massive peaks in the distance to be sharp. 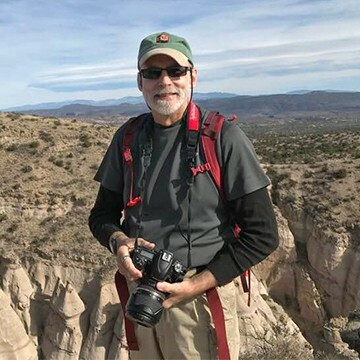 With a 20mm lens at f11, I could focus at about 4 feet and know I had everything acceptably sharp, from the rocks two feet away to the granite peaks at infinity. A wide-angle lens gives you a lot of depth of field. But what about using a telephoto lens with a much shallower depth of field? Knowing the hyperfocal distance can be even more important when zooming in. 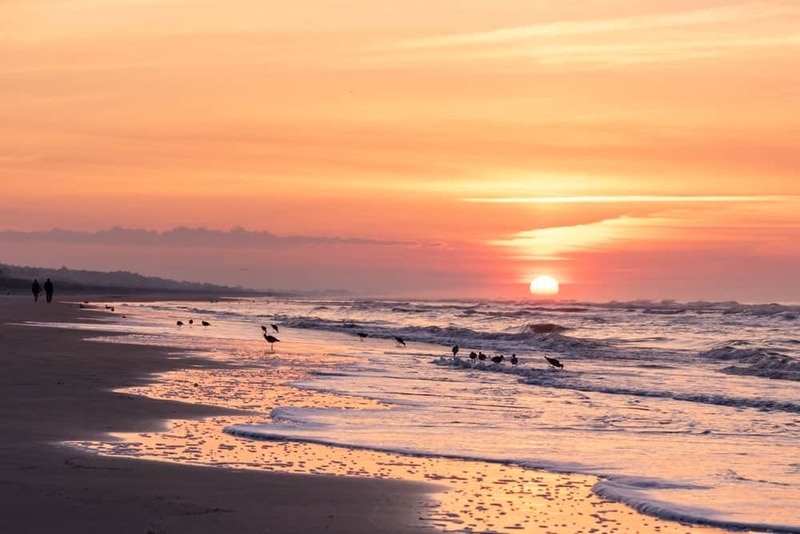 Imagine being on a beach at sunrise, when the light is rapidly changing and the waves and birds are in constant motion. I want the birds in my photo but I can’t get very close to them. With my lens at 85mm, I can focus on the birds at about 80 feet and know that I’m far enough away that I’ve got 40 feet (half the hyperfocal distance and most of my foreground) in focus. I frequently look for scenes with a strong foreground element, and interesting middle ground and a distant object, like a mountain. They all have to be sharp. I don’t have the budget for a tilt-shift lens and there are plenty of times when focus stacking wasn’t going to work. That’s when I go to my old standby, hyperfocal distance. Over the years, I’ve done this so often that the tables in PhotoPills are ingrained in my brain. It’s something all photographers need in their toolbox.